1.1" C.A. Custom right-angle design shown. Designed specifically for CO2 laser CV joint cutting system. Housing incorporates 1.1" diameter 5.0" F.L. 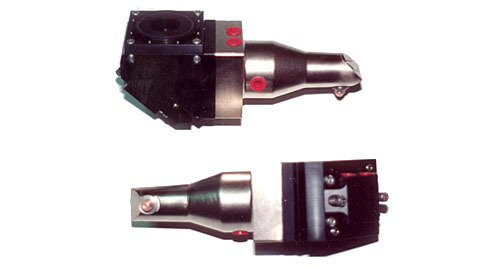 focus lens and water-cooled housing containing 90º copper bending mirror. Many designs are available or can be built for systems similar to this.